Theranis was a Breton thief and a former member of the Thieves Guild who involuntarily resides in the basement of the Castle Skingrad. 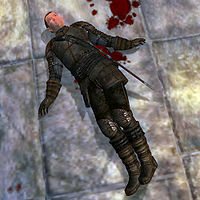 He was sent to the castle to obtain the ancient book Lost Histories of Tamriel but vanished without a trace. As the Gray Fox himself wants that book, S'krivva will ask you to investigate what happened at Castle Skingrad – and what became of their Cat Burglar. Asking the beggars in Skingrad will reveal that Theranis wasn’t very good at keeping secrets: "Theranis was drinking in the Two Sisters Lodge. He was bragging about stealing something from the castle. Unfortunately, Captain Dion was also in the Two Sisters Lodge. He arrested Theranis and hauled him off to the dungeons." Once you arrive to the dungeons, Theranis is nowhere to be found. The only prisoner left is Larthjar the Laggard and he will give you some clues: "You mean the thief? He was in the big cell with that Argonian. They were always whispering to each other. The Pale Lady took him days ago." Just one in a long line of victims of the Pale Lady, you will find Theranis dead in the northwestern chamber of the Wine Cellar, lying in a pool of his own blood in the alcove opposite Amusei’s cell. When you ask Amusei about Theranis, he will tell you how they used to be cellmates, until they fell victim to the Pale Lady: "Theranis? How did you know about him? He was my cellmate. At least until the Pale Lady took him away." He wears leather boots, greaves, cuirass, and gauntlets and carries a steel dagger and shortsword along with a few gold coins. Esta página foi modificada pela última vez à(s) 03h37min de 26 de janeiro de 2016.